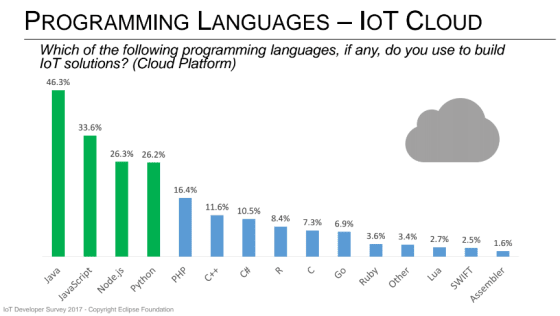 This is the first in a series of two blogs exploring the finding from the latest Eclipse Foundation IoT Developer Survey. A couple of months ago we posted a blog inviting developers to contribute to the 3rd Eclipse Foundation IoT Developer Survey. The 2017 results are now published with a total of 713 respondents, from all over the world. The survey gives an insight into the current state of play in the making of the internet of things in 2017. As well as bigger trends about IoT adoption across various industries, the survey also provides a developer perspective on the methods they use today to build the IoT devices and solutions around us. So what does this mean for developers when building IoT solutions and the platforms they choose? It would be natural to think that they will be looking for Operating Systems that will support this variety of languages and libraries. 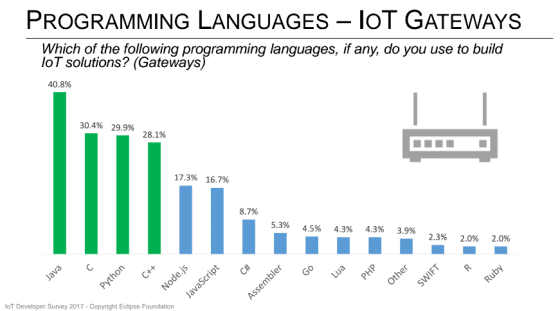 So it won’t be a surprise to see that, Linux was the OS of choice for IoT devices because of the number of distributions, tools, languages and libraries that make development faster. The kernel itself might be the reason for the success, with its well known and straightforward behaviour plus the ability to use drivers to adapt it to the various hardware types found in the field. 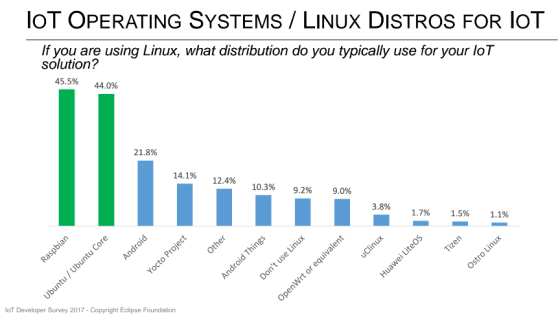 What might come as a surprise though is to see that among the various Linuxes in use in IoT, Ubuntu and Ubuntu Core were found to be a close second with 44%. Is it really a surprise though? 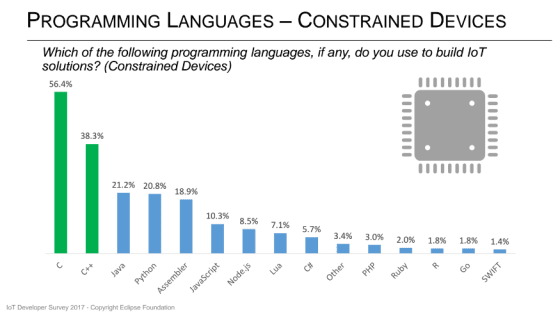 Both Ubuntu and Ubuntu Core are language agnostic meaning developers can work with their programming language of choice and more importantly it’s quite simple for them to install new languages and libraries thanks to the package managers. Building multiple services for gateways and other smart devices in an open source environment and in their preferred language then becomes a very attractive option. The introduction of snaps with Ubuntu Core has also brought a new way of working in the IoT space. Developers are now able to control exactly what they ship regardless of what OS it’s going to run on. This makes a developer’s life easier by saving the need to statically build everything in whether it is for a large scale deployment, beta or testing. Next week we’ll publish the second blog in this series exploring the survey from a business perspective.